Welcome to Pizza School, in which pizza-making amateur Gwen Ihnat learns the secrets from pizza-making pros. Most everybody agrees that the most important part of your pizza is the dough. But a close second: Sauce. Sure, you can buy bottled or canned pizza sauce, or even substitute Prego in a pinch. When I was a kid my family would buy jars of Ragu Pizza Quick (which I remember as being kind of gross) and tins of a pizza sauce that my brother would put on white bread in the broiler, topped with tons of dried oregano (we were a family of strange snacks). 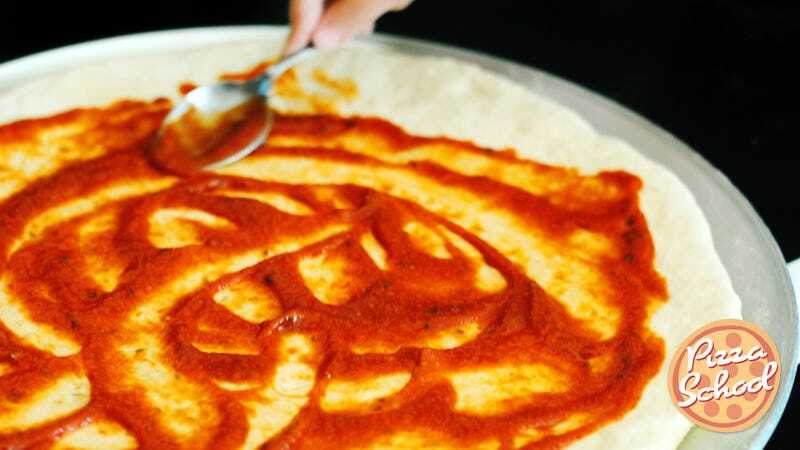 Still, if you’re already making your dough, is it worth the effort to make your sauce? Yes, says Dennis Lee, a Takeout contributor (perhaps you remember his experiments with Flamin’ Hot Cheetos?) and pizza aficionado. Dennis works at Chicago Logan Square pizzeria Paulie Gee’s, where local owner Derrick Tung (Gee’s also has a branch in four other cities) bakes award-winning pizzas in two ovens shipped from Naples, Italy. This sauce seems pretty basic, but, as Dennis describes, “All you need is basic ingredients. You need good tomatoes, and go from there. San Marzanos are awesome.” Derrick Tung extrapolated on tomato importance, explaining his laborious taste test to determine the ideal type for his sauce. But not every pizza place is so devoted to tomato purity. “I find that most places use sugar to mask weaker tomatoes. If you have an average or sub-par tomato, a lot of places will just add sugar. There are some New York pizzerias that will just buy whatever tomatoes are around, throw some sugar in it, and people are still pretty happy with it,” he said with a shrug. So for the second Sunday in a row (here’s week one), I set out to make my own pizza from scratch. Dennis’ sauce, as he said, really couldn’t have been easier and was easily transformable (I did add a little salt and crushed pepper). Honestly, my biggest challenge with this pizza school is the new concept of cranking my oven to 500 degrees. It means you look at your pizza once and it doesn’t look done and you look two seconds later and it’s too done. Which is kind of what happened here. So, next week: graduation. Should I go for the perfect pepperoni mushroom pizza? Or attempt a delicacy I have only enjoyed at fancy Italian restaurants: the white pizza, with potato or pear? Or—hear me out—should I try both? Combine crushed tomatoes and all dry ingredients in a medium saucepan and simmer over low heat for 15 minutes, stirring occasionally. Stir in fresh basil with a dash of olive oil, simmer for five additional minutes. Allow sauce to cool to room temperature before using.